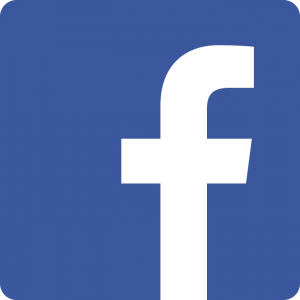 The Cherokee Nation of Indians published some 260 issues of a national newspaper under the titles Cherokee Phoenix and Cherokee Phoenix, and Indians' Advocate from 1828 to 1834. 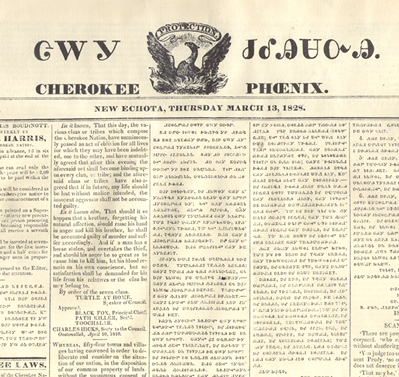 Both English and Cherokee language articles appeared in the Phoenix, with approximately 30% of the column space devoted to articles written in the Cherokee syllabary. Publication came at the critical time in Cherokee history, during the Cherokee "renaissance" and prior to forced removal of the Cherokee Nation to Indian Territory in 1838. By the late 1700s, the newly inaugurated United States began to supplant European dominance in the Southeast. As the United States asserted political, social and demographic control over the Southeast, its relations with the Cherokees and other Native American nations altered. A significant Native American population lived within borders of the eastern states. Also, the Southeastern Indian nations still held claim to thousands of square miles of land in the Southern states. Policy in the first years of the republic encouraged acculturation and possible assimilation into the dominant Anglo-American society. Latter policy promoted removal of Native Americans and resettlement outside existing state boundaries as an option. Such a removal became a possibility with the Louisiana Purchase in 1803. A determination to extinguish Indian title to lands east of the Mississippi River intensified after 1828 with the election of Andrew Jackson as President and in 1830 when Congress approved the Indian Removal Act. Amid conflicting policies of assimilation and removal, the Cherokees came to the fore of national attention with the Cherokee Nation's struggle to maintain its integrity, retain diminished homelands, and organize as a political entity. Confronted with mounting pressure to cede more lands and the possibility of tribal disintegration, the Cherokees experienced a "renaissance" of cultural development and purpose. 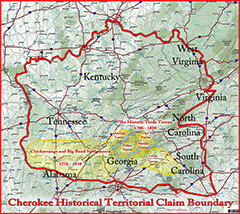 Cherokee achievements in the 1820s included agrarian improvements, the construction of roads, the application of mechanical arts, a concern for the education of their youth, social reform movements, formal organization of a Cherokee national government, and the development by Sequoyah of a written Cherokee language. In addition, in 1826 the Cherokee government authorized "that a person be appointed whose duty it shall be to edit a weekly newspaper at New Echota, to be entitled, the 'Cherokee Phoenix' . . . ."